High end liquor packaging is becoming more and more common. Trends show that people are tending to spend more on alcohol to enjoy at home vs. going out. This means that competition is bound to increase on the shelves. It can be hard to stand out in the sea of options at any liquor store. Unless a customer knows specifically what it is they want, the options are endless. And sometimes daunting. However, there's always one tactic all customers employ in some way, whether they know it or not. Packaging and design is one of the top decision-makers when it comes wine and spirits purchases. A customer is intrigued by the marketing--that is, the shape of the bottle, design on the label, or other unique packaging element--and they buy it. Which is why the message a bottle sends by packaging is so important. Check out this example of liquor packaging we recently created for Select Designs featuring Lamarca Prosecco's limited release, Luminore. Luminore is a DOCG sparkling wine (meaning a high-end bottle) and considered one of the apex wines where the grape is concerned. To design packaging that aids that impression, we started with the brand. Utilizing an organization's brand in packaging design is a key element to creating a connection for the consumer between the product and the producer. In addition to a beautiful bottle of wine, Lamarca is known for their striking light blue-on-black with foil stamping for extra pop. And you know that extra pop is everything when marketing a sparkling wine, right? With the brand on point, we brought in a straightforward approach with a two piece set up box. Paired with custom flocked foam inserts, these boxes are sturdy, stable, and can securely hold a glass bottle with little-to-no potential for damage. Just don't test that theory *too* aggressively! Creating limited edition packaging like this barely scratches the surface of our experience in the wine and liquor world. Artisan liquor packaging is something we do well, and our packaging positively affects the bottom line. When you're ready to start increasing sales by grabbing the attention of prospective customers, give Sunrise Packaging a call! When it comes to luxury packaging, what do you think matters most? Customers tend to notice different things, and those things aren’t always obvious to the manufacturer. While you might want a customer to read everything they can on the package, chances are they won’t. You want the customer to recognize the brand and colors, but how many actually do? Luxury and high-end packaging rely on some common tropes to float ideas into the minds of consumers. Soft wraps. Bold fonts. Foil inlays. And more. If you use secondary packaging, or a box encasing your main product, read on. The fastest growing luxury packaging market is the beauty industry. From make-up to lotions to creams, new products are hitting the market daily. But what entices a consumer to pick up a new brand? If you’re using secondary luxury packaging, 40% of those surveyed said that an easy-to-read name was an important factor in whether they gave the product a second thought. Additionally, 33% need the product to be easy to see on the shelf or display area. Makes sense, right? Customers can’t buy your product if they don’t see it – and they can’t recommend it if they can’t pronounce it. Additionally, customers want luxury packaging that’s durable. It might surprise you to know that there’s a market on eBay and other resellers for luxury brand packaging, from Lululemon bags to Cartier watch cases. Ensuring that your packaging is durable and hardy is a sure sign to convey high-end to customers. Thirty-six percent also note that the packaging needs to be easy to open. Depending on your market, this becomes increasingly important if you’re targeting baby boomers. Like it or not, aging hands aren’t as dexterous or strong as they were. Making luxury packaging easy to open helps them out. Highlight any other important selling points. Is your product eco-friendly? Say so on the packaging. Give consumers every reason to pick up your product boxes. By using these factors to design your luxury packaging, you can start to learn to what customers respond, and make it better with every iteration. Another option is to do it right the first time. 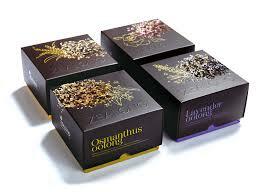 Contact Sunrise Packaging ASAP to leverage our expertise in the high end packaging market.